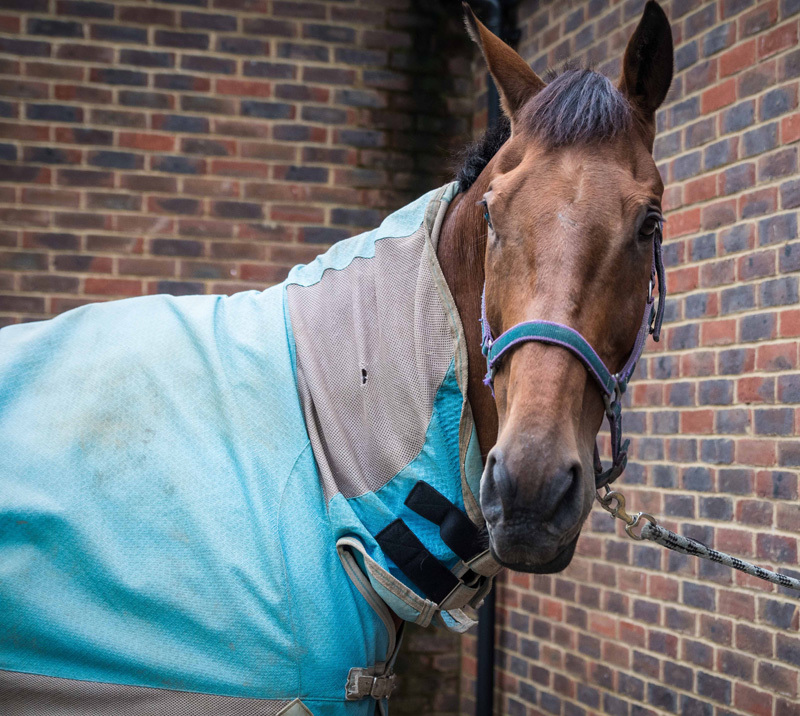 Gemma Tattersall must have gotten well used to issuing this essential briefing, because 15-year-old Arctic Soul, known at home as Spike, or, alternately, “Sharkface,” is equine royalty these days, with a fanbase as big as the courses he skips over so easily. 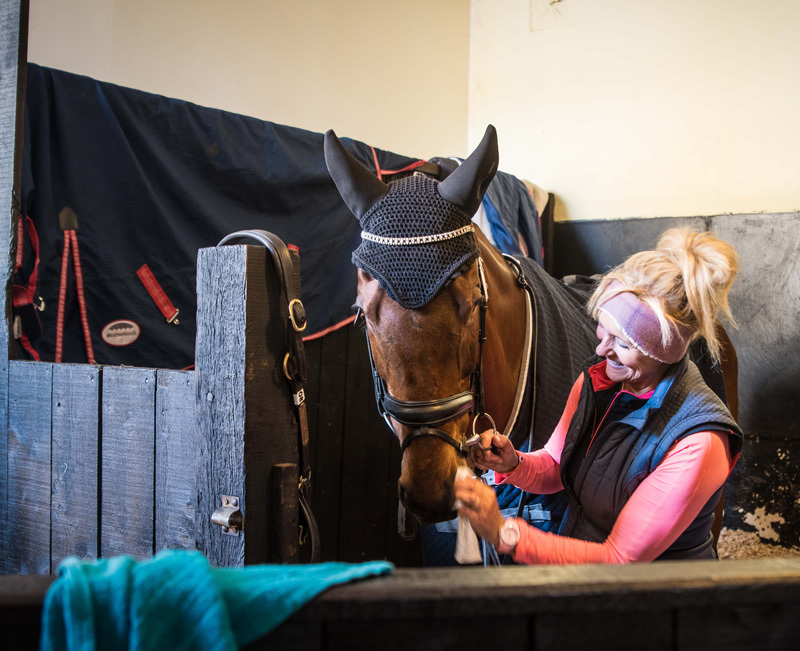 Spike finished fourth with Tattersall at this year’s Mitsubishi Motors Badminton Horse Trials CCI**** (England) and most recently served as the pathfinder for the British team at the FEI World Equestrian Games (North Carolina) and helped bring home team gold. But he’s also, like so many superstars, a little bit tempestuous. Where the Madonnas of the world might request M&Ms in their rider (but with all the brown ones removed, please and thank you), Spike has one simple request: You absolutely do not touch him anywhere but the approved stroking zone. Go for a pat on the neck, and he might take your arm off; massage his face, and he’s putty in your hands. All photos by Tilly Berendt. The Chronicle visited Tattersall and Spike (Luso—Dream Cocktail, Roi Danzig) at their West Sussex, England, base, nestled in an oasis of calm a short drive from London. There, we found out a bit more about the lanky ex-race horse who, with his equal components of lion and lamb, has several top 10 four-star finishes to his name, earned himself the title of British Open Champion in 2017, and finished ninth in his team debut at the 2015 FEI European Championships (England). • Despite his reputation for being a cross-country machine, he’s everyone’s go-to hack at home. Training him, too, is a joy for Tattersall, who describes him as “very chilled” in the school. But it wasn’t always quite so easy. He is, she tells us, a complex character at competitions, and until he learned that he could trust her, he was equally complex at home too. • Cross-country courses aren’t built big enough to suit him. With some of his best results including third at both Badminton and Burghley (England), he’s certainly proven that. In fact, “He just steps over the Vicarage Vee. His scope is freaky; he was born in the wrong era of eventing,” said Tattersall. You only have to take the briefest of glimpses back into the annals of eventing to see what she means. The “golden era” of the mid 1980s to 1990s, with its enormous timber fences and its quirky superstars, like Ian Stark’s Murphy Himself, would suit Spike to a tee. • He can be a bit of a Jekyll and Hyde character. As a result, Spike has to be cross-tied whenever Gemma or one of her six-strong team of staff has to do any of the essential fiddling that he dislikes so much. • Despite this, he seeks reassurance from the people in his life. At 16.3 hands and brimming with the self-assurance of a horse who knows he’s the best at what he does, Spike might seem like an independent soul, but he relies on the people he knows and trusts to help him feel secure in his ever-changing environment. One of those people is Tattersall’s mother, Marcelle Tattersall, who accompanies the pair to events around the world and steps in as traveling groom and, well, portable Wonder Woman. In the dressage arena, too, Spike can become rattled and lose confidence if the crowd makes too much noise, so Gemma has often had to ride into the main arena with a finger pressed to her lips, then, with the audience calm around him, he gains the confidence needed to perform at his best. Turnout time is pretty easy with Spike! • Spike prefers to live a simple life at home. Turnout time is of top priority at Gemma’s Tattleton Stud, and Spike makes it very clear that his “me time” mustn’t be compromised. 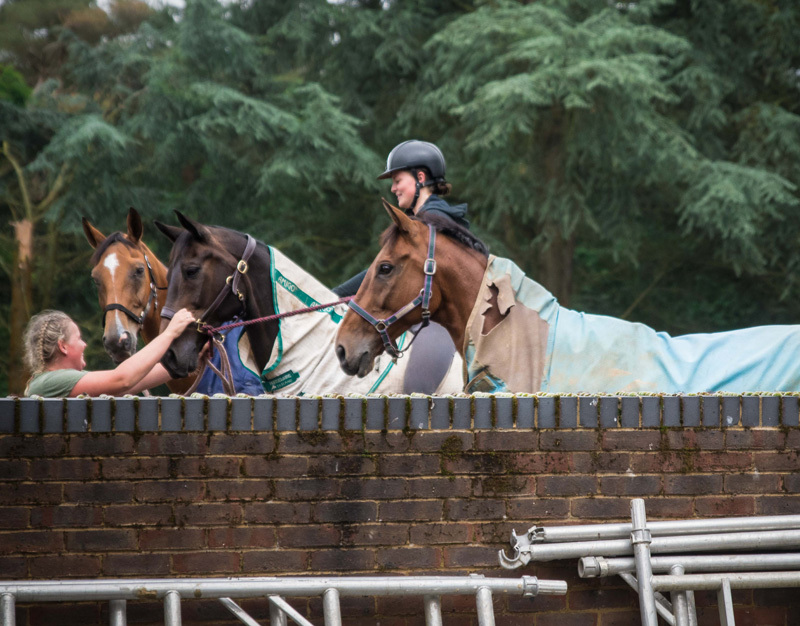 “He’s pretty horrifically grumpy if he doesn’t get to go in the field every day,” explained Gemma, watching on as one of the team climbs aboard, wielding just a leadrope and rides and leads Spike and his friends to the field. His reaction? Lamb-like placidity. You could almost be forgiven for mistaking him for a riding school hack. • He’s got a sweet tooth. “It’s always best to go at him with a treat,” Gemma tells us, unwrapping a packet of his favorites, Polo mints. • He’s given her some of her best memories. 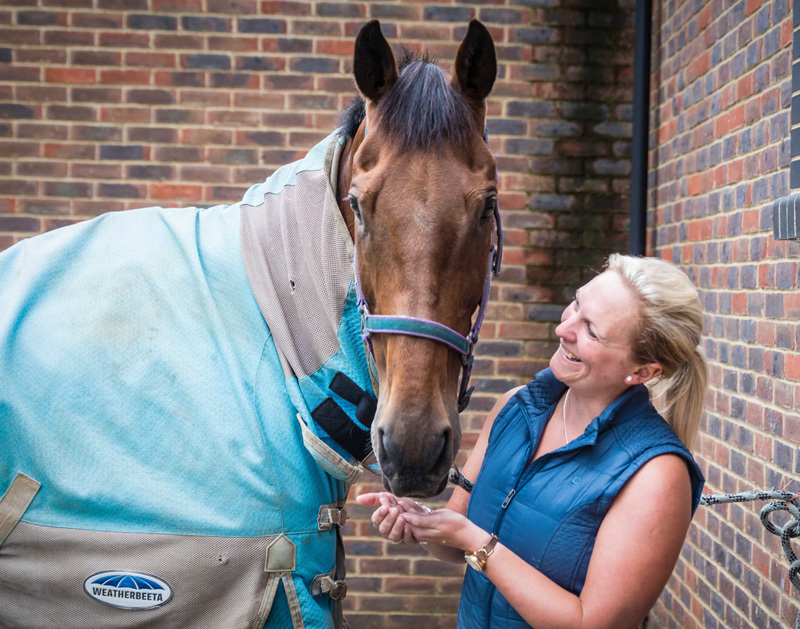 With four top-five results at Badminton and Burghley, the Event Rider Masters 2017 series title and a win in the British Open Championship CIC*** last year, Spike has given Gemma plenty of fond memories to choose from, but one in particular stands out. The pair finished on their dressage score. “It was just awesome. Michael Jung won, Andreas Ostholt came second, and all of it was a definite highlight. Something like jumping clear on the last day, we’d just never done that before at Badminton,” she said. • He might be one of the best eventers in the world, but his racing career was a different story. Trained by Colm Murphy, Spike ran just four times over hurdles in Ireland, never finishing higher than 11th place. But his early career has led him to become an exemplary example of the talent and tenacity of ex-race horses, with Britain’s Retraining of Racehorses group calling him a “great endorsement” for the Thoroughbred horse.